I would like to preface this gig review by saying that I knew almost nothing (and still know little!) about the Horrors, except 1) their album ‘Primary Colours’ was nominated for the 2009 Mercury Prize (with many bands putting their money on them to win), 2) they belong to XL Recordings, who have signed several of my now favourite acts, and 3) ‘Primary Colours’ has more synths than their debut album ‘Strange House’ (and I love them synths). So on the basis of these three factors alone, I thought it’d be a good idea for me to get educated about them and witness firsthand what the fuss about them was all about. First on stage were local band Casper Bangs. Their first song out of the gate, ‘I Woke Up’, made me think that they were Weezer-lite – not an insult, merely an observation on their enjoyable, mainstream rock ‘n’ roll sound. 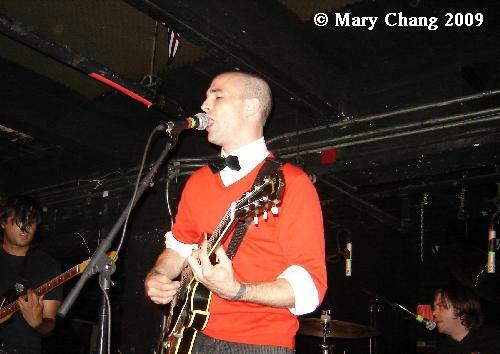 Singer/guitarist Casper Bangs was wearing a red jumper and a bowtie, furthering the geek rock theory. ‘Queen of Hearts’, a song the band will commit to a 7″ soon, sounded extremely promising. As they got further into their set, they became less Weezer and more harder-edged, culminating in ‘Skylark’, a swirly maelstrom of sound. I wish these guys the best of luck. I dunno, maybe it was the attitude of the second band on the bill, Crocodiles, that made me think they were from London. So imagine my surprise when I did some Googling and found out Crocodiles were a duo (not a four-piece as they were last Saturday night) and were not English but actually from San Diego. Oops. The band is joining the Horrors on their whole North American tour, and based on their performance, I think they make an excellent match. Lead singer Brandon Welchez looks like a young Bob Dylan and slinks around onstage like Steven Tyler of Aerosmith. The band favoured flooding the stage with red lights (really quite unusual) and two California state flags were proudly displayed on their equipment cases. (Okay, I get it now.) They’re punk sounding to me, even though SPIN Magazine has reported that they used to be ‘dysfunctional punk’ and are now ‘prettier noise pop’. I don’t want to think what they sounded like before they made the switch. Songs like ‘I Wanna Kill’ and ‘Summer of Hate’ actually are better than the titles sound. My favourite was ‘Neon Jesus’, which had Ramones-esque oomph. Okay, the Horrors. I really, really tried to get into them, into their music. I really did. But sometimes music just isn’t for you. Maybe it started with the four instrument-playing members of the band taking the stage, and then one annoying bloke behind me decided to start yelling at the bassist, “rice!” over and over again (I don’t know if he was taking the mickey or what). The bassist responded with a seething snarl, “it’s RHYS!” Uh oh. Rule #1 of gig-going: never upset the talent before they’ve even had a chance to start playing. Everyone knows that’s bad karma, don’t they? Also, I prefer seeing bands that actually look like they’re having a good time performing on stage. During their entire set, each member had a steely, almost confrontational look on their faces that was unsettling. However, the crowd that had assembled to see them appeared to be unfazed, as if they expected them to look (all clad in black) and sound that way. So maybe not having seen them before put me at a disadvantage? I was standing in front of the aforementioned bassist Rhys Webb, who took to roaming the stage and whipping his bass around all over the place (sometimes dangerously near our faces) while he played. Guitarist Joshua Hayward, on the opposite end of the Black Cat stage, was similarly moving and grooving with his axe. Between the two of them plus frontman Faris Badwan going to and fro his microphone, I started to get motion sickness. I found Badwan’s voice not compelling enough to match the music itself – overall, great guitars, great synths, and great keyboards, like in the swirly ‘Who Can Say’. I thought, maybe it was the sound mix? But if you listen to their recordings, his voice is pretty understated against everything else. So maybe this is the way the Horrors are supposed to sound. And judging by the crowd’s excited reaction during the main set and their encore, they put on a good show and everyone left happy. After the jump: set lists and photos.